The principal attrraction of the Alixares hotel is the proximity of the Alhambra, it is only about 240 metres to the entrance. It is not right in the centre of Granada but you can easilly commute into the centre on the C4 minibus or a taxi would cost around 7 euros. The hotel has an outdoor swimming pool which is surrounded by gardens and a solarium with sunbeds it is open only during certain months of the year (from Easter until early October; from 11.00am until 9.00pm). At the top of the Alixares hotel is an open air eating area with a barbecue and a pleasant atmosphere. This is only open from the 15th of June to the 15th of September approximately, from 9.00pm until 3.00am. There is a private car park (15.50€/day – bookings not permitted). This is easy to get to the hotel from the ringroad which surrounds Granada. There is a restaurant with the following opening times of the Alixares Hotel. 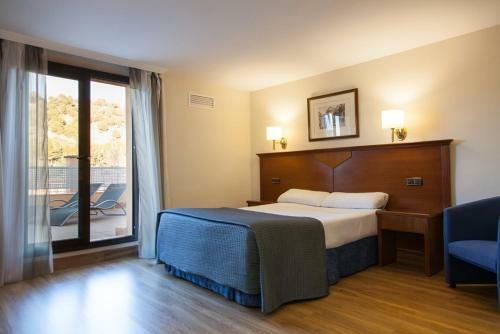 This hotel is 227 metres from the Alhambra entrance, 1295 metres from Plaza Nueva (the absolute centre of Granada), 2842 metres from the train station and 4099 metres from the bus station.